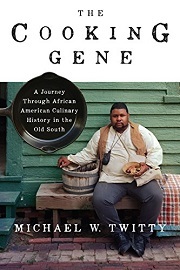 Subtitled “A Journey Through African American Culinary History in the Old South,” this book by Michael Twitty is part memoir and part history in which Twitty traces his own genetic heritage through food. Born in Washington, DC, Twitty shunned the greens and cornbread of his childhood home in favor of fast food, but as he got older, he became interested in his culinary heritage and learned to cook not just the food of his childhood but the food of his ancestors, using their methods. I wanted to read this because I grew up in the rural South, and so my own food heritage owes a debt to the ingenuity of the cooks brought in chains from Africa. I wanted to learn more about them so that I could give credit where credit is due. These cooks brought their skills to America, adapted them to the ingredients found here as well as those imported from Africa, and created their own cuisine, sometimes drawing on techniques used by the Native people who cooked here for centuries before them. Besides greens and cornbread, there was rice, barbecue, sweet potatoes, peanuts, persimmons, and bream. As they were brought further inland and further south, they continued adapting their skills to new environments, creating cuisine to serve inside the plantation home (sometimes, like James Hemings of Monticello, drawing on European training) and to their own families as they were able. There’s no single story of Southern cuisine, as the enslaved cooks used what they had, and what they had varied by place and time. But Twitty is able to trace some of the common threads and see how certain foods made their way through the South. He doesn’t dig very deeply into techniques and flavors; this is more of a chronicle of influences, as cooks and their cuisines move through the continent. Twitty also explores his own genetic history, getting tested by multiple companies to see whether and how well his genes match up with family lore. In doing so, he learns more about where in Africa his family came from and confirms that he has white ancestors as well as black. He visits grave sites and plantation homes and grapples with what his particular story means and how it fits with the larger story of history. I was interested to see that he claims not just his Asante and Igbo roots, but also his Irish ones, although his perspective on each differs, of course. He’s clear-eyed about where he comes from and approaches his story with curiosity but not without judgment where it is warranted. See, for example, his recent blog post about his white confederate ancestor, whose home he visits in this book. The book is packed with information, and at times I found it rather too dense and not always easy to follow. The links between sections and the book’s internal logic weren’t always clear, especially early on when it seems to meander from subject to subject. The mix of memoir and informational text didn’t always work for me, although I could appreciate why Twitty wanted to take this approach. Food is a highly personal thing, and Twitty uses food to understand his history, so it’s natural that his history will become part of the book. However, I felt like there were a lot of gaps in Twitty’s story that make the memoir portions feel incomplete. For example, I never really got a handle on when and how he started studying culinary history. I would have liked more on that and less on the genetic testing—the genetic piece of his story is important, but there was more detail than I wanted. Still, I was glad to have read this book, and I’m very glad that it exists and is getting so much attention. It’s essential that we learn more about the people who built our country and whose histories have been too easily erased. 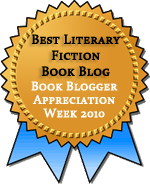 This entry was posted in Food, History, Nonfiction. Bookmark the permalink. I still really want to read this! Michael Twitty was involved with a project I was working on several years ago, and I met him at an event and he was SO NICE to me, the lowliest paeon, that I have never ceased to feel fond of him. What a lovely guy. He comes across as a pleasant person in the book, willing and able to get along with all sorts of people. It makes me happy to hear that he’s comes across that way in person, too. Thanks for writing about this one. It seems like it’d be interesting and I’m gonna put it on hold for my husband, who is the chef in our family and reads nonfiction exclusively.